I took small segments of pictures of the Moon with my cannon camera the dawn of September 3, 2010. When looking at the movies, I noticed that the Moon had a black halo. In close view of the black halo Moon, I also noticed a shadow on the left side of the Moon, as if the light coming from the Sun would be less on that area, something making an eclipse. Since the Moon is a mirror, reflecting the light of the Sun, my question is, could the Zetas comment if this observation could be a reflection of the Planet X corpus, filtering the light of the Sun that reached the Moon at that time? What would a shadow on the Moon, that changes position, and a come-and-go dark halo around the Moon mean? The tail of Planet X is in the vicinity, to the extent that a greasy halo appears around the Moon and Sun and the gray/black dust in this tail is streaking the Moon even during what is considered to be clear night skies. 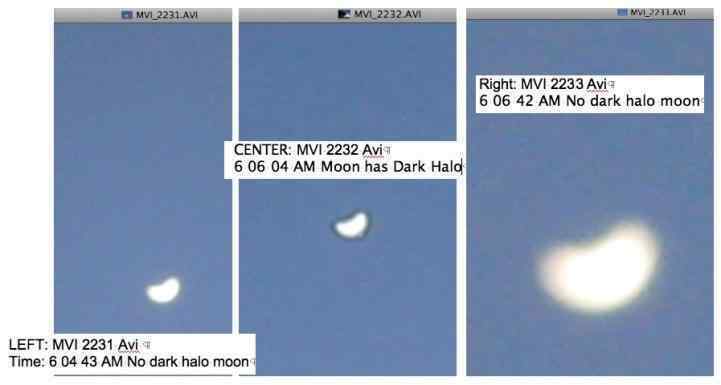 Why would a dark halo appear around the Moon? The Moon is reflecting sunlight sufficiently to shine through the gray/black dust, and is actually illuminating the dust at its edges so it can be seen! Without the Moon, this dust is wafting about, and those on Earth are none the wiser. You guys say that the Council of Worlds has deemed some people important to the Aftertime. How are such individuals determined? Is there anything particularly special about them, aside from being STO? What kind of roles would you expect them to play? 2. the person's Service-to-Other actions are important to a number of others, so the impact of their loss would extend to many others and be a loss to many. Most Service-to-Other individuals who have qualified for protection are outside of the public view, and you would not notice them. They work behind the scenes, and are not self promoters, nor do they expect any reward or even recognition. Nor would they think to ask the question you have posed, as it indicates a desire to be one of the people who receive protection. As we stated "the best hope of being protected, or healed, is to not think of oneself, but of others, intensely, and take action to help others". This area of New Zealand's south island supposedly straddles the border between the Indo-Australian Plate and the Pacific Plate that is pushing under at this point. 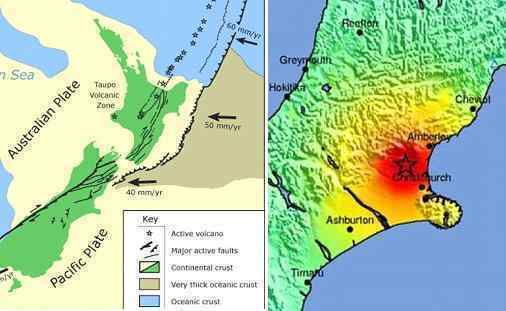 We have stated that New Zealand need not worry about having part of the south island disappear, as there is much mankind does not know and the true plate boundary is further to the east of the south island. We predicted that the rock and roll that the south island will experience would be akin to snow tumbling to the side of a snow plow in an irregular manner, rather than subduction or mountain building. Is this not what occurred? I have a question which relates to last weeks questions form NZ and Alaska about safe locations. Both NZ and Alaska will be moved close to the equator by the pole shift. The Ocean at the equator is 500ft higher than elsewhere due to the spin of the earth . 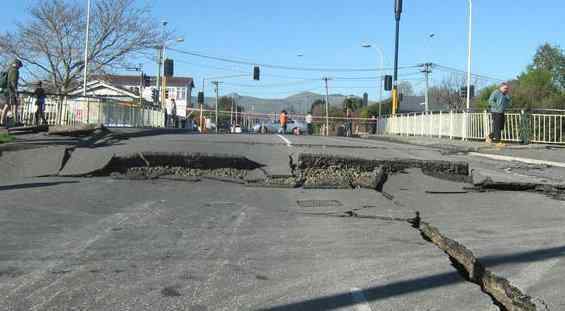 Thus tho NZ is raised 500ft due to plate tilting, it will lose this gain within weeks (?) after the earth resumes spinning. In Alaska you will have to allow an extra 500ft elevation for safety. And in both locations you will then have to allow 675 ft for polar melt and be able to move to an elevation above this after 2 years. Ideally in NZ ( Post PS) you want to be at the bottom of a 700 ft hill...with a path to the top. You live at the bottom to be close to the sea for fishing...and you move every month to avoid being flooded. You have to have your gardens higher up, and your orchard trees right at the top ..Bananas in this case.. as you will be tropical. Can the Zetas please confirm or comment. Your presumed rise of an additional 500 feet at the new Equator is not true, and is based solely on man's misunderstandings and miscalculations which are legend. How long ago was it that man assumed the Earth to be flat? We have stated that any excess in sea level at the Equator would only be a matter of a few feet too insignificant to even mention during our numerous safe locations dialogs on land that will find itself along the new Equator. If we have mentioned repeatedly the 675 foot rise in sea level worldwide do you not think we would have mentioned this factor also if it were true? We confirm none of your analysis, so stop trying to box us into an incorrect statement by such maneuvers. What is missing in man's calculations is the degree that the Earth itself bulges at the Equator, which man cannot calculate even with his satellite views. Man presumes that the Equatorial Bulge is due primarily to water pooling at the Equator, based on his erroneous math which is famous for not fitting reality. The Earth itself bulges at the Equator, due to centrifugal force, and the fact of shallow depths at the Arctic and around the Antarctic Plate have confused poor befuddled man into thinking that the deep oceans in the Pacific are due to this Equatorial Bulge. There is scant different in the depth of the water due to the Earth's rotation, because water seeks its level and when the water is slung to the Equator it becomes higher there and thus drains to the poles to equalize its level, as we have already stated in the body of ZetaTalk! 1-With this ongoing flooding in Pakistan, that Zetas confirmed is due to Indo-Australian plate starting to drop, did we move to a 7? Or is it not yet the event from Nancy's vision, "a significant subduction of India"? 2-We know 7 is Plate Movement, and 8 is Continuous plate movement. Would it be correct to suggest that 8 of 10 corresponds with "months before the pole shift" with its Devastated Cities and "emergency management teams exhausted"? What will plates and earthquakes do after 7 and 8, during the last weeks? We have stated that the 7 of 10 will "shock the world", and this has not yet happened. Each scenario included in the holographic presentation was the final outcome of a plate movement, not every minor quake or adjustment in sea level elevation along the way! We have stated that the 8 of 10 will involve continuous plate movement in some locations, but declined to detail further and for good reason. We cannot get the public to connect with our description of the pole shift, in the main, as they abstract it and do not process the description emotionally. After the 7 of 10 episodes have occurred, we will have your attention, and then we can give details on what is coming next. Of course the Moscow underground housing the trains will not be standing all the way until the pole shift! This is an example of someone not absorbing our descriptions of the last weeks, when the Earth will be moaning constantly and quakes will likewise be almost constant, everywhere. After the pole shift, alien contact will happen in the conscious mind if that individual gives the "call". I personally feel that one of my job's after the pole shift is to help bridge the gap between alien and human contact. My question Zeta's is, "Will there be Humans that help make the connection between Alien and Human contact?" Another words, show the people who are afraid that it is OK! Our beloved space brothers are here to help guide us, not harm us! Conscious contact will only occur when anxiety will not be increased. This means that conscious contact for a group must mean that all within that group have already had individual conscious contact, and be at ease about the matter. Of course it is helpful to have a contactee declare that they find their visitors loving and enjoy the conversations. But it will not happen that a contactee leads humans who have not yet had their own conscious contact to such a meeting. This would alarm, rather than reassure such a novice, and would thus run counter to the guidelines. The eastern edge of the Indo-Australian Plate has experienced considerable quake activity this week, suggesting a rise in that part of the plate. Is the recent flooding in Victoria, Australia the result of plate bending/breaking as explained during the excerpt from ZetaTalk Chat Q & A for June 19, 2010 "Certainly the Australian artesian basin will be affected by the Earth changes, and well before the tipping of the Indo-Australian Plate during the hour of the pole shift. We have mentioned that plates being raised will often bend at the point where they are rising up from ground level, and thus losing the support they used to enjoy. For Australia this breaking point occurs 1/3 of the way across the continent from the eastern shore. East of that point it is rising from the magma, and west of that point being pushed down into the magma so the plate can plunge under the Himalayas." The rains and flooding in Victoria have been in the highlands, not the lowlands, nor has there been any change in sea level elevation along the coastlines. The floor of the Coral Sea has been sagging during the lift, but beyond this there has been no significant bending of the plate above or below the waves. When the Indo-Australian Plate is tipped to the extent that the eastern part of the plate will be lifting above the magma supporting it, the bend will be along what is currently low land in Australian. As we have often stated this represents weak point in a land mass where the rock layers are thin. For Australia, this will be from the southernmost part of the Gulf of Carpentaria, to the east round Mount Isa, down through the Central Lowlands (which are below sea level) and thence SW to the sea. Season of CC's 2010 ends, so i made research of CC's that appeared in this season and which are still unexplained. The Russian crop circle is showing the Severe Wobble and associating spirals during this time, as they will be much in evidence during the last weeks. Wentworth Castle is showing irregularity, as have many circles during this year. This has been a summer of a wobble that went from a predictable Figure 8 to jerking around, an irregular wobble. Likewise with Czhechia, which shows particle flows from the Sun in an uneven pattern. The tiny orb to the right is at a side of the Sun where the particle flows are regular and normal. The orb to the left is creating a backup in the particle flows. Planet X has created a disturbance in the particle flows. This is not just coming round from behind Planet X but creates flow disturbances elsewhere in the solar system. Belgium is showing a symbol used frequently in crop circles, the key, which is sweeping in a retrograde orbit. This has been used in crop circles to show the effect or impact of Planet X, coming retrograde toward the Earth, in both its orbit and rotation. Earth Changes Media Newsletter, September 07, 2010, Announcement Coming Tomorrow by Mitch Battros - Earth Changes Media "A more detailed layout of what appears to be unfolding now and in our near future will come forth over the next few days, beginning with tomorrow's Part-I "The Mayans Were Right - The Pole Shift Has Begun". Stay tuned to ECM to capture every word and pronunciation telling of some final pieces of the cosmic puzzle unfolding as I write." [and from another] Hi, this is Johan, Saint Lucia. I have been following this Earth Changes, Mitch Battros for a long time. Interesting at first, then I found out he was all taken in by NASA, which he took as a recognition, an endorsement from the big NASA and ever since, all we have ever seen is studies of new finding far away in the unknown universe, stars exploding, new stars being born, always far away, never anything what is happening around us, in the immediate solar sytem environment, which we now know why ofcourse. Still, he always connected to the Maya elders and their messages and now all of a sudden, out of the blue comes his big announcement, the Mayas were right the polar shift has begun. Is this a link between the inevitable and trying to hang it unto the Maya culture, I surely do not expect a change of heart from NASA and their accomplishers. Why all of a sudden the big announcement that the polar shift has begun? Any idea? Mitch Battros is hungry for the stage and will do anything to be the spokesperson for the current and coming changes. He early sold his soul to NASA, becoming their willing shill and attacking Nancy's posture on Planet X. Mitch claims, dutifully, that it is all from the Sun, but lately has noticed that NASA is failing to make their case. Nervous, he established a new association to elevate himself to the stage, or so he hoped - the Mayan elders. The Mayan elders are not aware of anything more than is already known. They are clueless and guessing! In that Mitch has always postured himself exactly opposite Nancy, his nemesis, he will not be able to change his tune and adopt what she has been saying all along. Thus, he fails on all fronts. 2 Asteroids to Zoom Between Earth and Moon's Orbit, 9/8/2010 news = Debris from Planet X's Tail instead? http://news.yahoo.com/s/space/20100908/sc_space/2asteroids [and from another] Published September 08, 2010 FoxNews.com "Skywatchers get ready: Two asteroids passing nearby tonight should make for quite a spectacle. NASA says two small asteroids discovered just days ago will zip harmlessly past Earth on Wednesday, a double flyby that should be visible through a telescope. Both asteroids should be observable with moderate-size amateur telescopes, the space agency said -- stressing that neither has a chance of hitting the Earth. In fact, asteroids like these are relatively common." Relatively common? Relative to what? Then why the story? NASA and JPL have always planned to use asteroids to explain the Moon Swirls of Planet X, and noting more trash in the vicinity of Earth decided to issue this announcement at this time. That the announcement coincides on the same day that a fireball left a 300 foot crater in Colombia was a happy coincidence for NASA, as it stands as an exclamation point on their statement that such small asteroids are indeed in the vicinity and pass close to Earth on occasion. They avoid discussing the reason that more such rocks are slinging by, lately. Will the public buy their explanation for the increase in fireballs? The public, as polls show, is highly suspicious of any pronouncement from NASA, due to their decades of denying the alien presence when UFOs have been sighted on their images. The public sees the Moon and Sun out of place, and the weather changes not explained at all, and connects the dots. NASA is one big lie! In the Aug 4th ning chat, the Zetas stated that the New Madrid 'adjustment' is the "7 out of 10" event [their exact quote: "We have warned that quakes on the West Coast, or the Seaway, or in the New Madrid region will occur before the major quake in the New Madrid region we have referred to as the adjustment on a 7 of 10 level."] Yet the poleshift itself may occur many months later, even more than a year later; conversely, it could also occur in this same year (as the New Madrid 'adjustment'). Because the New Madrid 'adjustment' will probably result in numerous bridges being shattered or at least made impassable, it appears that many of us living in cities (where there are at least some jobs) may end up being trapped in them many months prior to the shift, and unable to get to our 'safe spots'. Obviously the Zetas have counseled us ad nauseum to move ASAP, as in yesterday, but they also recognize that for many people that's simply impossible, because most people can't afford to leave their jobs or to purchase land in the rural areas. My QFZT thus is; Can we expect the New Madrid 'adjustment' to destroy more bridges than just those over the Mississippi, the St. Lawrence Seaway, and those that connect the land masses around the Great Lakes? If so, do the Zetas foresee the authorities being able to rebuild them in the intervening time before successive cataclysms and 'adjustments' occur? Altogether, is it theoretically plausible that if we are not in our 'safe spot' (speaking of those living in the cities in the eastern half of the US and on the coasts and banks of the major rivers and lakes) ASAP after the Japanese quakes? It might be almost impossible to think of getting there with our 'bug-out bags' and even meager preparations? It has me thinking that for many of us, we need to be out of the cities way before the last weeks provide naked-eye viewing of PX. You misunderstood our statement on the New Madrid quake. We did not say the New Madrid would be the 7 of 10 incident. We stated that this quake would be of a magnitude to be considered at the 7 of 10 level. This, to differentiate between the 5, 6, and 7 magnitude quakes that will afflict the new Madrid and West Coast areas prior to the major quake in the New Madrid area that we state will be the one presented to Nancy in the holographic presentation. In other words, please do not ask us, whenever a 5, 6, or 7 magnitude quake hits, if this is "the one". You will know when the quake of which we speaks hits. There will be no doubt. We likewise, as we have so often stated, cannot give you specifics on date/time/location, so asking how long you will have between the big New Madrid quake and the last weeks is forbidden. We cannot answer, as you know. Your astonishment that bridges will go down, and not just bridges across the Mississippi, or that people in cities will be at risk is also something we have repeatedly stated. As the Earth changes begin to ramp up, and people do more than intellectually process our predictions, the reaction is to exclaim "tell me it isn't so!" It means what we have stated it means, way back when at the start of ZetaTalk. You are an intelligent man! 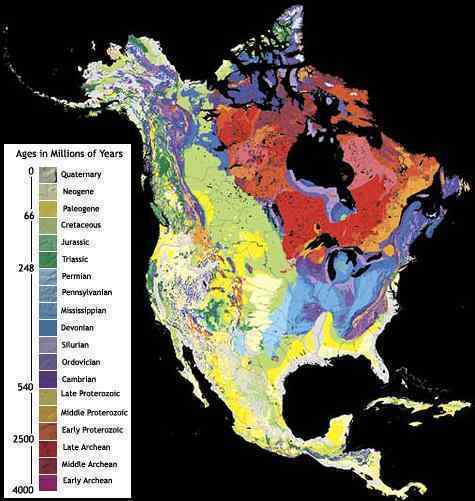 What do you think will happen to the rest of the N American continent when the New Madrid rip occurs, accompanied by adjustments all along the Seaway? Every city from the Midwest to the East Coast will be affected to some degree. Just when travel restrictions will be applied is in the hands of man, so we cannot predict. But we have always stated that the sooner you are in your safe locations, the better. The choice is up to you. I was wondering if there are any psychic practices that we might be able to meditate on to make the sift any less dramatic? Can you recommend any practices or entities to work with that could help ease the transition for us individually and to support all of humankind/Earth Life? Thank you for any advice you can offer. You are seeking to avoid the opportunity to help others! This is self focus. If you can't escape physically, by being included in a Christian Rapture or the Lift that is extended to those who are highly Service-to-Other and desire to survive the pole shift so that they can help others, then there must be another way! 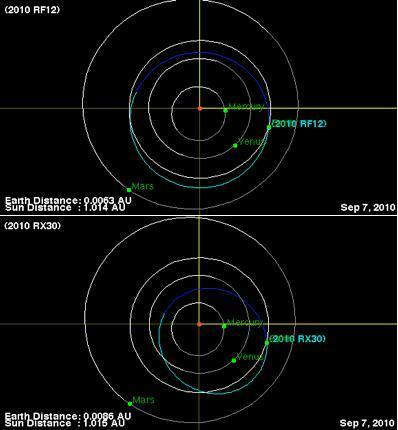 The pole shift is no different from occurrences ongoing today, except for scope. You will be the one starving, where today it is only the stick children in Africa or the very poor who are starving. Somehow this means the pole shift will be worse, as it will affect you. Today, there is earthquake and accidents, humans injured and not rescued, but during the pole shift this almost certainly will be you that is affected as no one in the world will escape! Thus, it is suddenly an imperative! There is one way to lessen your anxiety, distract you from your pain, and which will ultimately be of benefit to you - focus on others. As is well known, the individual who focuses on others feels less pain and anxiety, as they are relieving their own anxiety by engaging in a wider network of caring and assist, thus making this network real. Pain management works best if the individual does not focus constantly on the pain, but can distract themselves. This is our advice to you. Stop your self focus! With regards to the "sloshing Pacific in the straits off Victoria" the Zeta's explained would follow the 8+ magnitude earthquakes in Japan, how much "sloshing" can be expected? I have a friend who lives water front there who I warned about this and he expressed some concern about this. Would it be the likes of a major tsunami or excessive high, rolling tides? Also would the Vancouver area be greatly affected by this as a number of populated areas are at ocean level. The Ache tsunami was 50-100 feet in height on all continents affected not 20-30 feet. It doesn't much matter the source of the tsunami, whether from earthquakes in Japan or earthquakes from subducting plates off the coast, both can result in deadly tsunami. Any tsunami affecting the strait of Juan de Fuca by default, because a tsunami rolls to all coastlines affected equally, would affect ANY inland WA and Canadian coastline on the Juan de Fuca, and not just Victoria. And how about the Pacific coast of WA. Won't they get hit with a tsunami first? Anyone on the strait, anyone on the sound, anyone on the coast, would want to know, including Vancouver BC, Seattle and the coastal communities of inland WA. Would you kindly please ask the zetas for clarification about their warning? Where Vancouver Island lies entirely on the Juan de Fuca Plate, but this plate is not homogeneous. 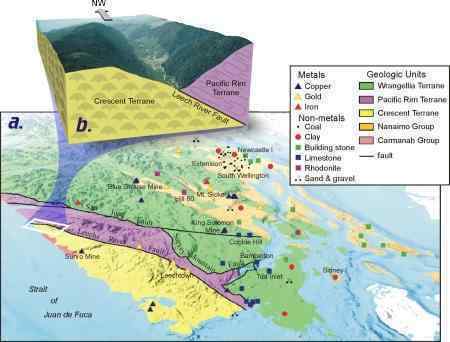 It is composed of different rock strata, and as we have noted in explaining why the Seaway rips as it does on the N American continent, rock strata do not bond firmly to one another. The Strait of Juan de Fuca passes Vancouver Island where 3 different such rock strata abut each other in close succession, and thus the Leech River Fault. A jolt to the Juan de Fuca Plate, because of adjustments in the Pacific following the Japan quakes, will cause these strata to slip. Where this might create sinkholes or other such minor changes in the ground along the Leech River Fault, it will certainly set the deep water in the straits to sloshing. Victoria is at an extremely low sea level elevation, and Victoria West and James Bay which are AT sea level will be swamped by this sloshing. Towns elsewhere along the straits or on neighboring islands have more protection in elevation. Much of Victoria will find water in its streets to a depth of 20 feet, with little warning as the reaction to the Japan quakes will come across the Pacific from plates pushing plates with lightning speed. This is not a tsunami. I have been posting the earth wobbles from the worldwide seismic data. They are now beginning to show up every 18 hours. Is this the wobble that the Zetas were addressing? Assuming that this frequency will accelerate? http://aslwww.cr.usgs.gov/Seismic_Data/heli2.shtml [and from another] The twice a day shuddering that used to occur during the wobble would be just ahead of the 0 and 12 UTC points, at what we called the Face and Dark sides. This was when the Atlantic Rift was either facing Planet X or in opposition on the dark side of Earth at midnight UTC. Presumably this pattern is still there. An analysis of the last 30 days earthquakes above magnitude 6 shows this pattern still active. But an analysis of the live seismograph for September 10, 2010 shows a slight shudder also at 3, 8, and 17 UTC. Even when the live seismographs were almost dead quiet on September 11, 2010 that patter still showed. Quakes above magnitude 6 also line up with these times. The rattling wobble has formed a pattern of sorts, though just as soon as this pattern is understood or recognized, it is likely to change. As Nancy has pointed out, the twice-a-day shudder - when the Atlantic Rift is facing Planet X at 12 UTC and later at 0 UTC when it is in opposition on the other side of the globe - is still present. Since the Atlantic Rift runs from Iceland to South Africa, this involves a tug that affects the entire globe. As Nancy's earthquake analysis shows, the scope of quakes is broad during those times, running pole to pole, and tends to hit those points which are already vulnerable to plate movement - the S American roll, the folding Pacific, and the diagonal pull on the N American continent. The daily Figure 8 roll caused by the N Pole of Earth being pushed away when it comes over the horizon continues. This occurs when Planet X is facing the central Pacific at 18 UTC and as would be expected hammers at the brake point near the Solomon Islands. At 3 UTC a similar point is reached when the N Pole of Earth is hidden behind the horizon so the globe can bounce back. Significantly, a quake occurred in the Reunion Islands off the eastern coast of Africa in Nancy's analysis during this time. But in addition to the Atlantic Rift tug and the N Pole push and rebound there is also stress on the globe from Earth glancing off the magnetic field of Planet X. This is not the temporary tug or the back and forth shove but a sudden flip to the side into a temporary lean to the left or opposition. As is known, there is a magnetic anomaly just to the west of South Africa, which acts almost like a second S Pole for Earth and is positioned on the other side of the Earth at the same latitude from the Earth's magnetic S Pole. The N Pole of Planet X grabs this anomaly, as it is a type of S Pole, thus lurching plates nearby. Significantly, in Nancy's analysis, Chile had a quake during this 8 UTC time period. 1. They have "ghost" trails or ethereal looking bodies around them/ trailing them. They appear to be moving "in" the clouds. Searchlights don't. 2. Searchlights tend to follow a linear and regular pattern, those appear totally random and writhing in an irregular pattern. 3. 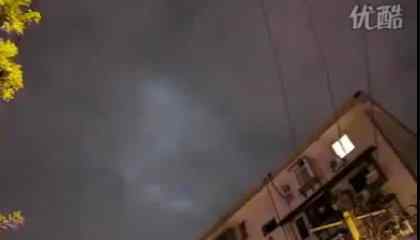 When its cloudy like that you would easily see the searchlight beams. 4. Searchlights jerk in their movement. Those things flow like fluid motion, beautiful ! What do these dancing clouds mean? Interpretations run from dancing dragons from another dimension to UFOs within the clouds. The explanation is more mundane. Swirls are common in nature but usually take the form of a tornado or dust devil or whirlpool in the water. Rapid movement of one air layer dropping down or rising or water dropping or rising creates these swirls, because the Earth's rotation creates a circular movement in the atmosphere or in water. Even water flushing down a toilet or down a drain will exhibit a swirl, as will smoke curling up from a smokers cigarette. During inversions, where air layers can be trapped over a smoggy city so that little fresh air arrives, any hole in the air layer capping the city will create vertical movement. This, combined with trapped smoke from nearby cooking fires created the effect! I am from Ukraine. Sorry for my English. There are two big heights on Ukraine: Pridneprovskaya and Podolskaya (higher), on the right bank of Dnieper. It is no doubt, that significant part of this territory will not be covered by ocean after a Pole Shift. However, would you be so kind to say what climate we have to expect on this places. And may it be a desert in a future? What influence from European volcanoes will be on this territory? What probability of Firestorms during the Shift, taking in attention odd oilfield near Poltava (there are no volcanoes in Ukraine)? If these heights are unfit as a good place for living after a Pole Shift, would be it better to consider mountains (the Carpathians or Crimea) as a shelter for Ukrainians? We recently addressed the Urkaine in great detail, and have recently hinted broadly how the public can do their own research to verify the safety of the chosen locations for the pole shift. The time will soon arrive when Nancy will no longer be available to scold the public and point them to the tools they could themselves have used. We are thus using this opportunity to scold and advise when there is still time for ourselves or our emissary to take endless questions on matters either already answered or where the answer is within the tools available to the public. Step 1 is to research your location in the Safe Locations information on the ZetaTalk website. In this you should examine not only your country, your state or province, or your city but also any nearby. Your specific town may not be covered but the whole river valley may be predicted to flood and to flood permanently. This would be a clue that your specific town will be likewise affected. We cannot and have not addressed every spot on Earth, due to time and energy constraints, as we expect you to have a brain and take this approach. Step 2 is to research your location from the standpoint of the climate that will exist after the pole shift. This is quickly ascertained by looking at the New Geology map. This is a free map which can be cut out and taped together and will give a general idea of the latitude to expect. If your chosen location is where one of the new poles will be, this is a clue that you need to rethink or plan a migration route. Step 3 is to research your elevation above sea level. A handy and free tool is Google Earth which can be downloaded into a PC and will show the exact elevation of any spot the cursor passes over. Google Maps is a modified version that allows a color coded map based on elevation. Our advice to be 100 miles from a coastline and 200 feet above sea level to avoid the coastal tidal waves during the pole shift should be applied. You can determine your current elevation and whether your location will be 675 feet above sea level where the water will rise within 2 years after the pole shift. A rough guide in this matter is the map Nancy created. Step 4 is to determine if you are in one of those regions which will rise or fall. India and western Australia will be below the waves as of the time of the pole shift, and being pushed down before the pole shift. 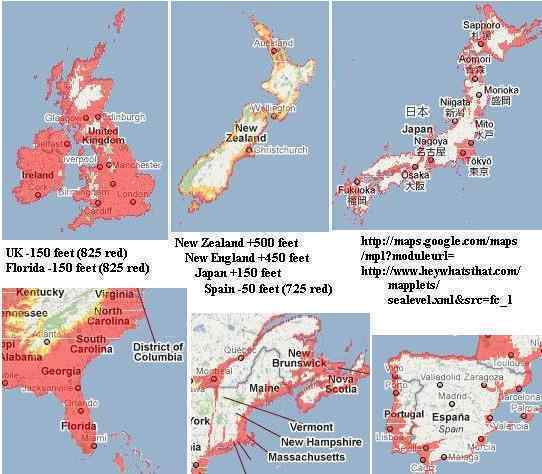 Japan gains 150 feet, New Zealand gains 500 feet and eastern Australia benefits also, Spain loses 50 feet, western UK loses 150 feet, New England gains 450 feet due to the Seaway rip, Florida loses 150 feet, and Vancouver Island gains 100 feet. Step 5 is to research the effect of swollen rivers which will likely be in a backwash during the pole shift. We have stated that all rivers will be over their banks, so the worst possible scenario should be assumed. What will happen if the river cannot drain? Despite having a good sea level elevation, any land that does not have an advantage of being at least 200 feet in elevation over a major river bottom in the vicinity is likely to be flooded. A backwash from the main river in your vicinity should be assumed, so that creeks will not drain, for instance. Water on the move tears and bites and scours, and will undercut the soil under buildings so they will tilt and tumble. Being on solid rock that will not melt in this scenario is advised. Tidal bore along cliffs facing the ocean can likewise have water climbing up, or funneled up by ravines which will direct water all the way to Guadalajara from the Pacific, for example. Think this through, for your location, and be on the safe side. Step 6 is to examine your volcanic or geographic risk due to mountain building. We have advised a 100 mile radius from all volcanoes that have been active within the last 10,000 years, and that Yellowstone will not become a super volcano. You can determine if the new westerly winds will blow volcanic ash in your direction. Consider that what was formerly north will now be west or east. Fire storms, though extremely rare, almost always occur near erupting volcanoes during the hour of the pole shift. We have advised that if in areas subject to mountain building that old rock not shattered is a good guide to what will survive, and newly fractured rock is a clue that more of the same might be expected. Older mountains as the Alps and Appalachians are considered safe, where the Sierras and Andes are building. Step 7 is to ascertain if you need a migration route. It is possible to survive the pole shift by avoiding tidal waves and staying outside of structures that will crush you, but to be in a position to be flooded within 2 years after the pole shift. Siberia is a case in point. Here the land is so low in elevation that vast swaths of land will be flooded, and survivors must plan to migrate on foot or via boat. Survivors near the new N Pole off the Bulge of Brazil might consider migrating toward the Andes and their familiar tropical warmth. Such migration, and your target location, can be plotted. Migration routes can be expected to be crowded, so should be avoided as a location for survival camps in general.